It’s really strange how it all started. 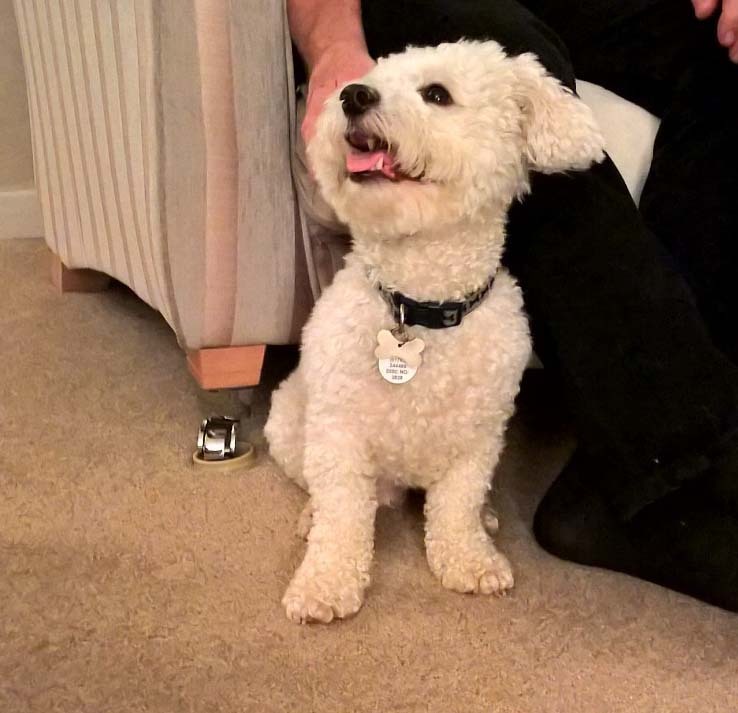 My clients have had the little Bichon Frise for just a few weeks – he came over from Ireland with an unknown past – and the young lady quite unwittingly bought him a laser light thinking that he would enjoy chasing it. Just a few seconds triggered something in the adorable and affectionate Buddy that has been unstoppable since. The slightest shadow or reflection starts him off, as even do flying birds. On a walk recently some swallows swooping about overhead had him leaping about and barking frantically. The behavior seems to be triggered by stress and excitement as well as any actual shadow or light. When I was there, someone coming back into the room was enough to start him off again. If there is no shadow to see, the young dog will look for it. It follows a three-stage sequence which starts with Buddy prowling about, his eyes up at the walls. Next he becomes more agitated, to the extent that by now he is deaf to any calling or distractions. Finally he erupts into a wild fit of barking, charging about from room to room and now it’s hard to catch him. They have tried everything they can think of including putting him in another room which seems to settle him. This is particularly hard to deal with, mainly because with most behaviors that we want to eliminate we arrange the environment so the dog has less opportunity to rehearse them. In this case the shadows may not actually exist in order for him to start fixating. 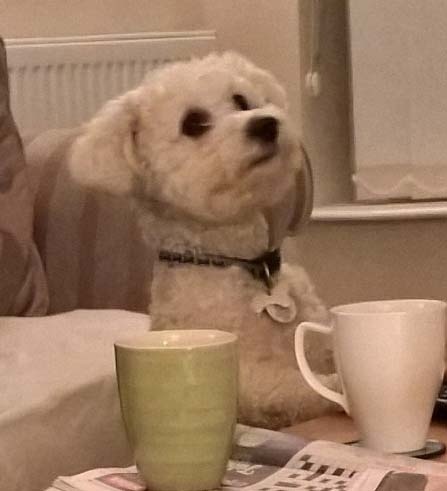 It was evident early in our meeting, by listening to the lovely family and watching the little dog, that he spends much of his life far too aroused. They feel that he was probably neglected in the past and bless them they are doing all they can to compensate for this now. They feel guilty when they leave him alone so make a big issue of their comings and goings. He has more or less constant attention. He may have four walks a day, one possibly for as long as an hour and a half. When he gets home from walks he can be in a hyper state which tells me that the walk hasn’t really done what it’s meant to do. Over-exercise and stimulation is possibly little better than too little. They have had him for three months now and want to make his life as fun as possible, so, like many people, they stir their dog up intentionally in the belief that exciting him is the way to make him happy. I suspect that everything is simply too much. Probably the contrast with his former life is also simply too much also. Our approach is to tone down everything. Lower, softer voices, gentler petting, no deliberately exciting him before going out, short and calmer walks where he can do a lot of sniffing. Play should be careful. At present it’s far too exciting. He grabs something and ‘loves to be chased about’. Toys and balls are thrown for him to run after which can simply be fueling his fixation with moving things. We looked at calm games that will exercise his mind like hunting and foraging. We did some gentle clicker training, the aim being to get him to touch a hand – a way of calling him away from shadows before he gets stuck in. Using a clicker, we also marked and rewarded him each time he chose to take a break from looking about, before he got too carried away. There may be other things he can be taught to do that are incompatible with chasing shadows – like settling somewhere or looking away at something else instead. The environment needs to be made as helpful as possible. If doors are shut he can do less charging about when he’s in a frenzy. If he’s less stimulated by letters coming through the door and so on, there will be fewer triggers. Finally they need to step in a lot sooner than they have when taking him out of the situation to calm down. The ‘quiet room’ is a room where he’s happy to be alone – a spare bedroom. It can be dark, with soft music especially produced for calming dogs. It’s sad when everything has been done to give him a great life by his new family that it’s backfired on them so badly. Over-exciting him hadn’t occurred to them as part of the problem. It’s very possible that the laser light merely woke a latent behavior in him that he had done in his previous life. We will never know. I am convinced the key is to get him calmer and more relaxed on all counts which means that his humans must be calmer and quieter around him too. Each shadow-chasing dog does it his own way, so I don’t go into complete detail here as to our approach. Anyone with a dog who fixates needs professional help. A clicker isn’t a magic tool, it’s just a bit of plastic. It’s worse than useless unless used properly. It would be a good idea if these laser lights sold in pet shops for cats, came with a written health warning.